How was everyone’s weekend? I’m finally recovering from my cough last week. However, I still have the lingering cough. Fortunately, my doctors don’t think it is anything serious. Some of you asked about why I was nervous about my cough well that was one of the things my oncologist says to look out for. If the cough continues to linger it could be a sign of metastatic cancer. So the anxiety was a little high. I’m prescribed some meds and hopefully the cough will clear up in a few days! When it comes to summer, without a doubt my wardrobe converts into blue and white (aside from the trending color. This year it’s yellow and I am loving it!). The color combination blue and white has that cooling and refreshing look to it. It kind of reminds me of the ocean and for some reason I associate the ocean with the summertime. So any time I pick out a new outfit, I naturally gravitate towards blue and white colors. Now that the heat is on, I’ve been wearing dresses nonstop and you bet I am wearing blue and white! 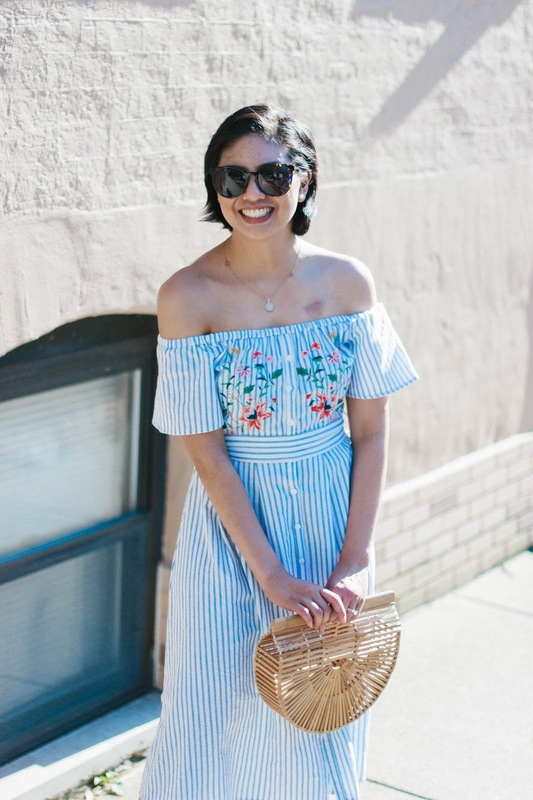 How cute is this striped off the shoulder dress I scored from Alice & Wonder. Unfortunately, it is not available online but if you’re in Chicago, Alice & Wonder opened up a store in the Lincoln Park neighborhood and this dress is definitely there plus many more cute things. It is kinda dangerous that the store is so close by! Anyways, I thought I’d share with you guys my favorite blue and white dresses for the summer. I will warn you that some may not actually be dresses but jumpsuits. However, I couldn’t resist sharing them! They have the perfect summer look and they’re just so cute! Most of the dresses I’m into are under $100 with a few that are around $120. I know this isn’t a dress, but like I mentioned above it is so cute for the summer! I love the cut-out detail and the wide-leg style gives it an appearance that it could be a dress. Shift dresses are a summer classic style and the lace up details just gives the dress a slight edge. This dress is just darling! I love the vertical stripes and sweetheart neckline. It seems like a perfect outfit for a day at the park or for grabbing a soft serve ice cream cone with sprinkles. 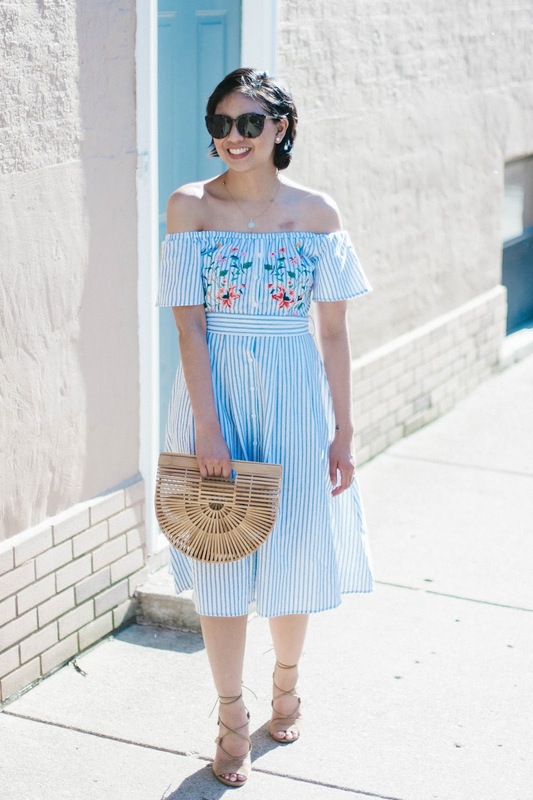 Tie-Front dresses are trending right now and I definitely want to try this trend out for the summer! My mom got me this maxi dress and I can’t wait to wear it. 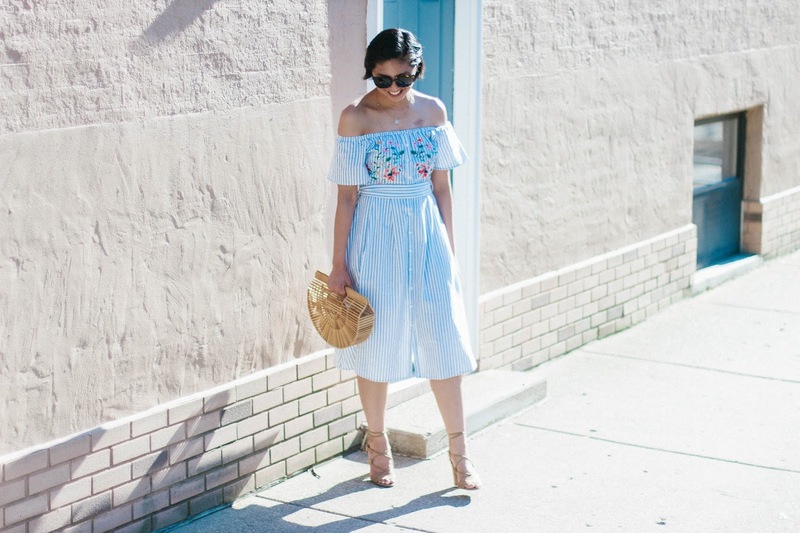 This dress is so light and airy and so comfortable! This dress kind of resembles the dress I am wearing in this post. It has the stripes and embroidery, and off the shoulder style. Gosh, I can’t get enough of off the shoulders! Another embroidery dress. I guess I am just really into embroidery too! Here’s another jumpsuit. Again it has the wide-leg style that emulates a dress and the wrap style is so chic! So switching gears over here. In about a month or so, Nordstrom will be having another HUGE sale. This sale is known as the Nordstrom Anniversary Sale. I look forward to this sale because Nordstrom releases their Fall pieces and has a huge markdown on them during the Anniversary Sale. I know, I went from Summer to Fall in this post but it is so worth it once you see the markdowns. 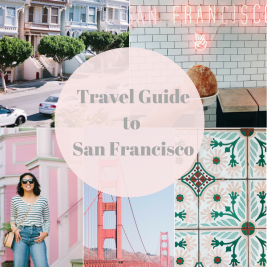 Anyways, since it will be coming up soon, I teamed up with other bloggers to give you an opportunity to win a Nordstrom gift card so you can use it during the Nordstrom Anniversary sale! Good luck to the participants! I was just thinking yesterday about how much blue and white is in my summer wardrobe! Can't wait for the anniversary sale! Such a lovely dress!! It really suits you! 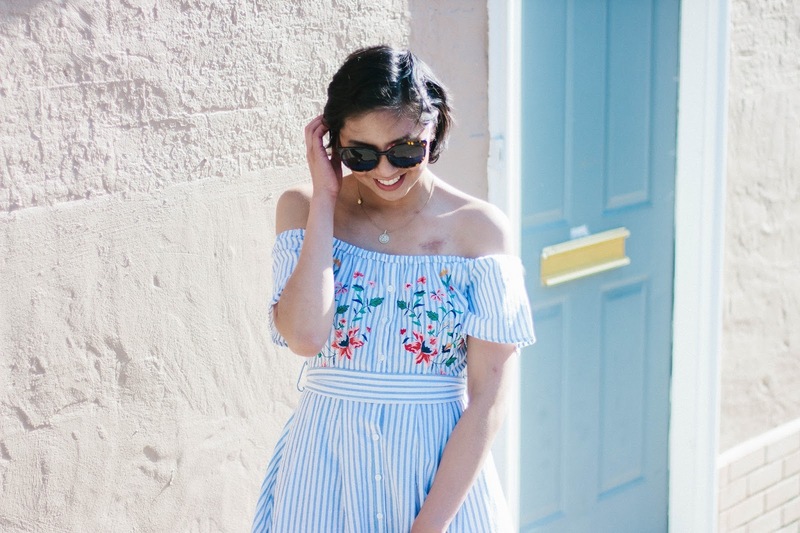 Adore this little blue striped dress! Such a cute dress and perfect for summer! Looking great Rachel! It's great to hear that you are getting better, Your outfit compliments with the summer vibes! I am so glad too! Thank you Bash! Love a good striped dress! The length and embroidery on this one are perfect! Thank you Bryn! I am so relieved too! Oh my gosh, don't even remind me that the Nordy Sale is coming up—I'm trying to not shop as much! And You look like a summer dream! The embroidery makes this dress extra special. Oh, and I've seen that purse everywhere, and everytime I see it I get THAT much closer to buying it. Don't tempt me, Rach! Haha, I know so dangerous! I tried to hold out as long as I can about the Ark bag but I couldn't stop thinking about it! Girl, I think it is a sign you need it too haha! You are killing it in the dress department lately! This blue and white with the embroidery has me all heart eyes! I am so glad it sounds like your cough isn't anything serious. I can see how that would be very anxiety producing. Thank you so much Amy Ann! I LOVE the dress you are wearing in your post! I am so glad it isn't either. Anxiety is still there but I hope that as it gets better that it goes away. Thanks Nicole! I am so relieved it too! Now if only it goes away I would feel much better! I need this dress in my life. I always love the dainty look of blue and white pinstripes! This is the cutest little dress, Rach! You look amazing and great giveaway!!! Such a pretty dress on you! I love blue and white dresses, which makes it even more perfect when summer rolls around. Love the wide leg jumpsuit you linked! This dress is gorgeous!! 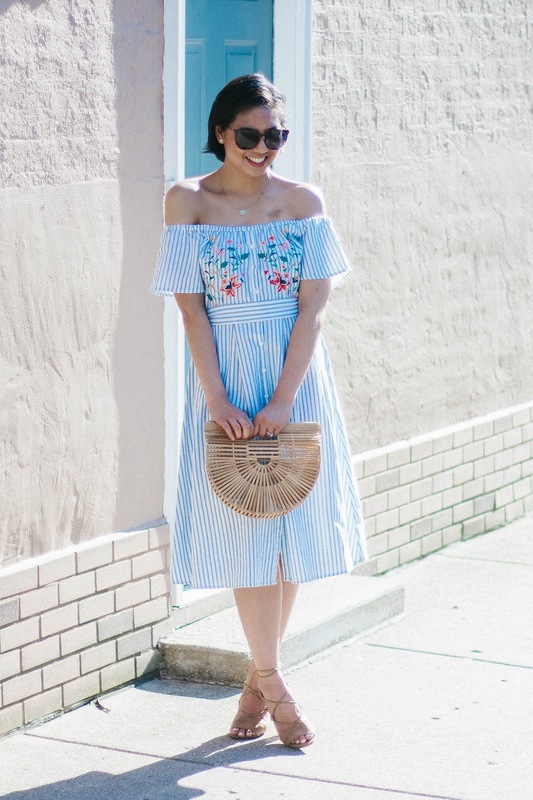 The light blue stripes are definitely one of my favorite prints this summer – you look amazing! Glad your cough is nothing serious and hope you recover quickly!! Thank you Allie! Crossing fingers that I do! Blue and white dresses are the best! Love this look girl! I love the embroidery and off the shoulder style of this one! Rach you are just killing it in your dresses lately! 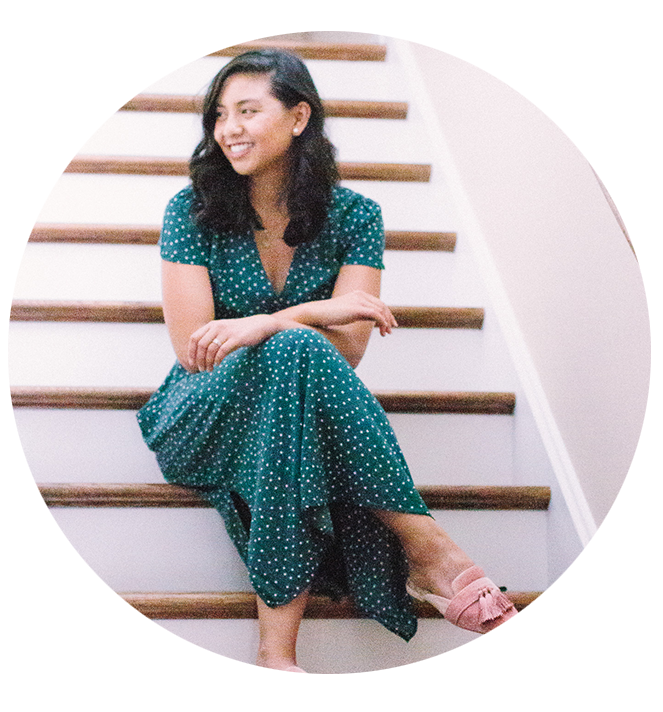 I am not much of a dressy person but you honestly have me wishing for some pretty feminine pieces in my closet! You look gorgeous! I need to step up my dress game! Thanks for sharing your lovely photos!!! You are too kind Auna! I love your style and you are killing it no matter what! And Im obsessed with the cult gaia handbags! I want to get one, but I really wish they would have a little shoulder strap… as I would not be able to just carry it around… mostly now with a baby! Thank you Ileana! Its definitely one of my favorite purchases! I bet with a baby! Congrats again! He is beautiful! I love this dress on you! So gorgeous! I love this dress! So gorgeous on you! Absolutely adorable! 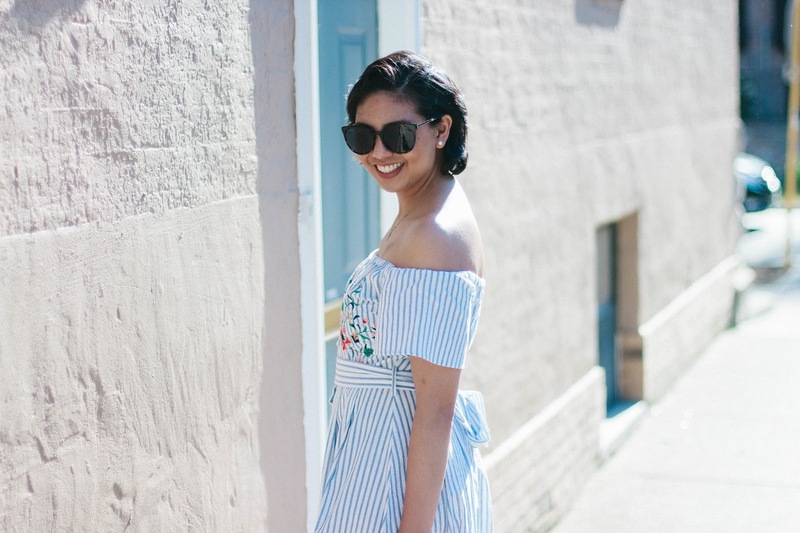 I am hosting a impromptu red white and blue link up today, I hope you'll come link up this beautiful dress! This dress is an absolute beauty! I love the stripes and the embroidery! I could wear this on a vacation! I'm glad you are feeling better! This dress is so pretty and I love the embroidery! The dress is so cute and dreamy. 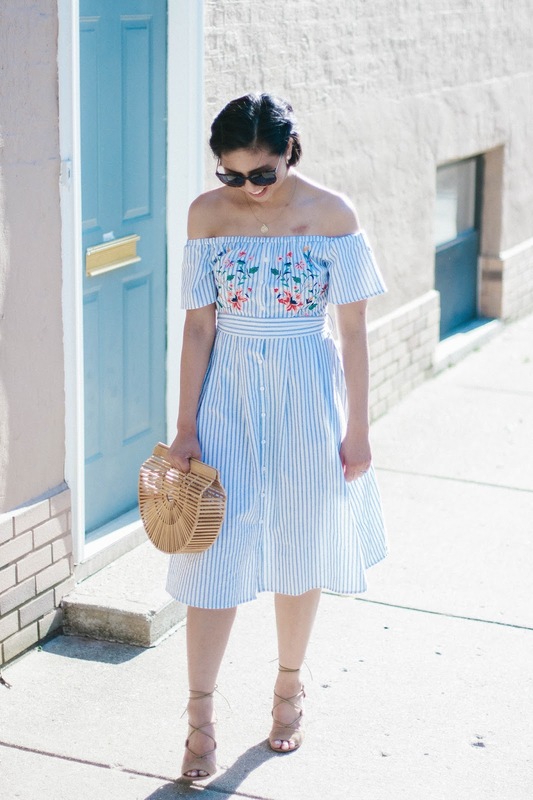 Loving the vibe of this dress…very summery and peaceful. U look beautiful. This dress is gorgeous. You look stunning in it. And I love the bag as well. I'm obsessed with this dress!! It looks amazing on you! I absolutely LOVE this dress on you! I'm hoping and praying your cough goes away fully soon so you have no need to worry in the slightest! Such a cute dress! Love the stripes and embroidered flowers, and you've styled it so well with the Ark bag! Perfect for summer! I am so down for alllll the blue + white combo pieces this summer! 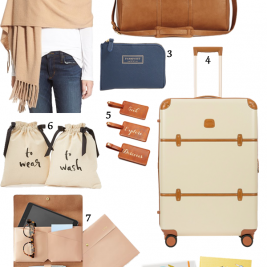 Great picks + fingers crossed for the giveaway! Stunning dress! I love blue and white pieces! I am in love with the dress and the bag! Hope you're having a great week Rach! Thank you Julia! Hope you have a great week too! I love those dress! You look really amazing! This dress is gorgeous! I can't get enough of blue and white lately. I need to get in and check out Alice and Wonder next time I see you! Yes! Everything there is so cute! This is such an adorable dress!! Love how you put this outfit together. This is just the perfect dress! 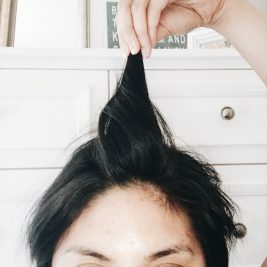 Love the length and cut! Wish I was in Chicago to grab it! Thanks Virginia! They have an online shop too! OMG this dress is everything. 1- Love your new blog format. Not sure if I've visited here since the updates! 2- You look amazing in your dress. Checking out the link now!! And a couple of your suggestions! 3- NORDYS giveaway is AWESOME!! Hope all is well m'dear!! Xo!! Hi Amber! I think you have! This was updated in March? Thanks so much! This is a great outfit Rach. I am so glad that you are doing better now. I pinned this outfit cause it's way too cute! Seriously love this dress and your other picks! Aw thank you so much Tina! I've been pinning your stuff all the time haha! This is the cutest dress ever! I love the embroidery details! That chambray jumpsuit is calling my name! That dress is so darling for summer, love the embroidery! Wow this jumpsuite is so cute.Love the light blue stripes and the emroided detail perfect for summer.I thought it was a dress at the begging. I'm SO happy to hear that your cough is getting better! I can't imagine how scary that would've been. This dress is gorgeous though! I love the embroidery on it and it fits you like a glove! I love all the details on this dress – the embroidering, the waistband, and the buttons down the front. You look gorgeous!